A molded-case circuit breaker (MCCB) for use in mines and tunnelling is an electrical protection device designed to shield a circuit from damage as a result of overload or electrical faults. An MCCB is a vital piece of apparatus for electricals where load current will exceed the capability of a miniature circuit breaker, and is essential for both the safety of mining staff and the longevity of the equipment they use every day. MCCBs are triggered in cases of thermal overload, short circuit, and ground faults. When these events occur, the MCCB will use its electromechanical trip units to safely halt the flow of electric current. This helps to minimise a mine’s risk of fire, explosion, or related hazardous events. Carroll Technologies Group offers the widest range of electronic equipment available to mine owners across North America, including a range of mining MCCBs from Eaton. Both new and factory serviced, each mode is a high-quality product which guarantees mine owners efficient running and a safe working environment for their employees. Eaton’s 40-year commitment to the mining industry means their MCCBs can be relied upon to provide the very best in circuit-breaking technology. The products have been extensively tested for reliability in hazardous mining environments, designed collaboratively with engineers from several reputable coal companies. Eaton’s mining MCCBs are designed to protect all sizes of trailing cable, with minimal panel design and inventory requirements, and come in seven frame sizes to fit your individual needs. The majority of units can also be installed in the field, allowing for simple on-site customization and replacement. Field testing is also straightforward, as each MCCB includes a convenient built-in test port, compatible with the 120 Vac test kit. Likewise, mechanical testing couldn’t be easier, with a push-to-trip button on each unit which can be triggered to confirm functionality during routine maintenance. Eaton’s 310+ electronic trip unit technology means these MCCBs are triggered faster than microprocessor-initiated instantaneous trips. The peace of mind delivered by these technologies is second to none, guaranteeing “faster than instantaneous” clearing times and enhanced safety measures. Plus, with an Eaton MCCB, you’ll always be able to visit a Breaker Service Centre (BSC) to maintain your device. If it maintains minor physical damage or general wear and tear, BSC staff will be able to restore your device to full functionality. 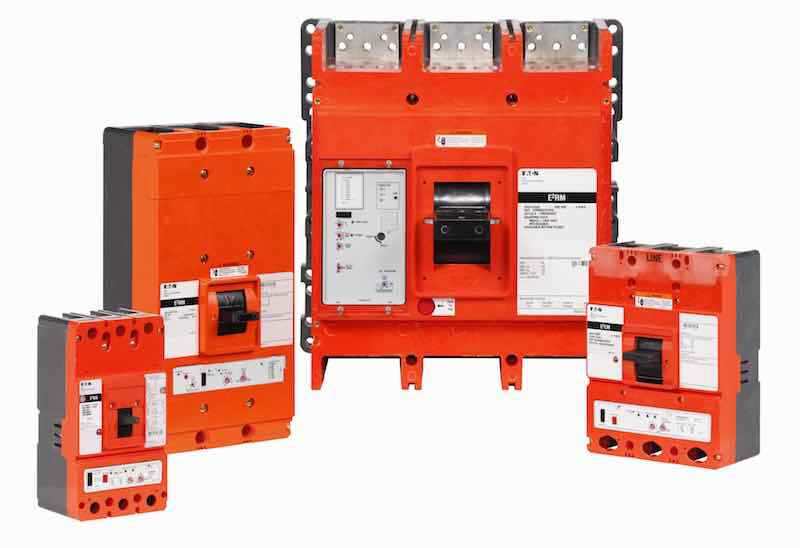 Should a device be beyond repair, Eaton offers credit toward the purchase of a new MCCB in exchange for the old model.